Masidi launching the ecological corridor for the Bornean Elephant at Myne Resort. 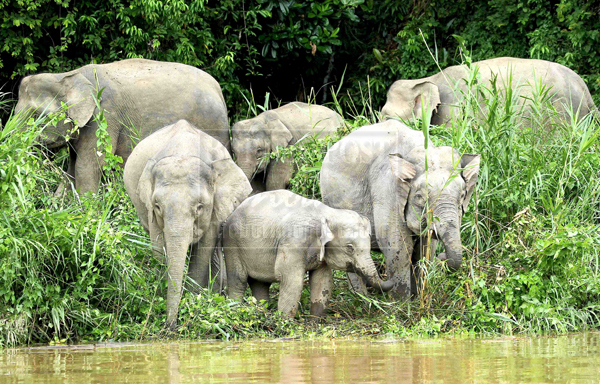 The Bornean elephants at Kinabatangan. KINABATANGAN: Myne Resort has set aside 160 acres of land at Kampung Bilit, Lower Kinabatangan as an ecological corridor for the Bornean elephants. 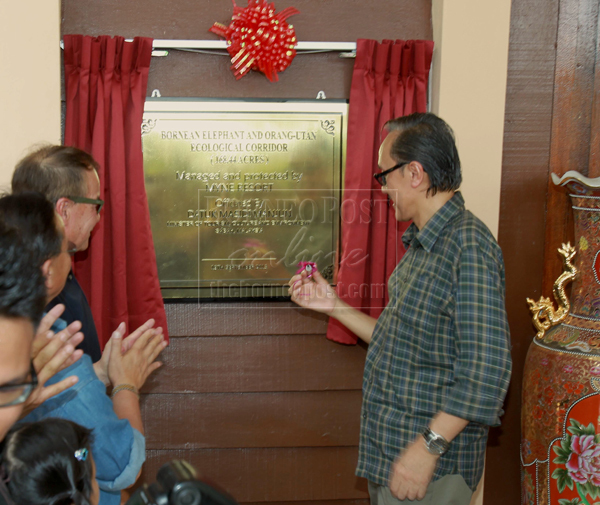 Myne Resort managing director, Ouh Mee Lan said that the Myne Resort was supportive of the effort undertaken by the Sabah Wildlife Department (SWD) and the Borneo Conservation Trust (BCT) to enhance the ecological corridor for the Bornean elephants at the Lower Kinabatangan. “I hope this will provide protection for the land from any threats, including encroachment of plantation activities and subsequently improve and secure the ecological connectivity of the Wildlife Sanctuary at the Lower Kinabatangan,” he said. On Sept 19, the land was officially launched as an ecological corridor by Tourism, Culture and Environment Minister, Datuk Masidi Manjun. Masidi recognized the value of the contribution made by the resort and expressed his hope for other agencies and stakeholders in Kinabatangan to continue supporting the initiative for the survival of the Bornean elephants in Borneo. He also commended two more companies – Syarikat Yu Kwang Development and Proboscis Lodge Bukit Melapi – for supporting the Bornean Elephant Conservation Plan. The two companies have also pledged to support the conservation plan by providing and protecting the Bornean elephants’ ecological corridors at their own forested land. SWD director, Datuk Dr Laurentius Ambu commended the efforts by Myne Resort, Syarikat Yu Kwang Development Sdn Bhd and Proboscis Lodge Bukit Melapi for their support and trust and for joining the effort to conserve the Bornean elephant in Sabah for the future generation. BCT’s conservation and research head, Raymond Alfred explained that BCT aimed to link all the key habitats not just for the Bornean elephants but also the orangutans in Sabah. He explained that habitat fragmentation has been identified as one of the key issues that needs to be addressed for the long-term survival of the Bornean Elephants and orangutans. “This critical missing link will ensure the long term survival of wildlife in Sabah, particularly the Bornean elephants and the Orangutans,” he said.